I know I haven’t written here in awhile. My biggest excuse is the setting up of our FamilyArchive Business, which has stretched my knowledge, abilities, and capacity to learn to new heights – I’ve loved throwing on different roles and acquiring new skills. Time in a day is limited, though, and I’ve had to sacrifice my writing time for it. However, in June, Curtis and I took a month-long trip out of NYC, for which I have over 1500 pictures, and amazing memories and experiences. I’ll be sharing my reflections here as I’m able. We started our trip in Astoria, Queens. As New Yorkers, I know traveling to Queens wasn’t a huge leap from Manhattan; however, we had people staying in our apartment the day before we flew to Florida, so we decided to start our vacation a day early. After checking into our lovely Airbnb apartment in Astoria, we braved the pouring rain and walked to Neptune Diner, a famous Greek diner in the historically Greek neighborhood. One thing we love about our traditional NYC diners is the ability to get anything at anytime; usually we’re at diners for eggs and sausage (side of [rye] toast…), but since it was almost lunchtime, we went with a gyro platter and tuna melt. 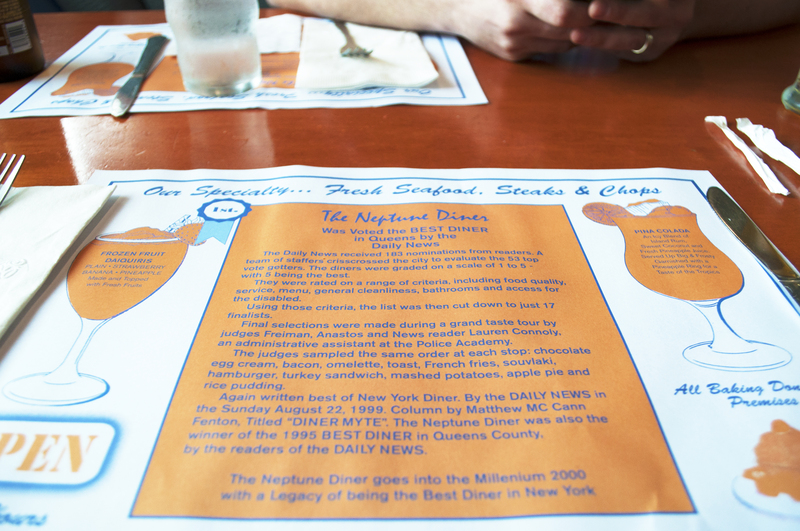 My sister wondered how diners could keep their entire, enormous menu in stock, 24 hours a day. I have no idea, and probably don’t want to see how much of my meal was frozen beforehand. But one has different expectations of diner food, and this meal, topped off by a chocolate egg cream, was a great start to our day. We did wonder, however, why the Greek diner was called Neptune and not Poseidon – because we’re dorks like that. Curtis pondering the rainy day. Notice the seashell-shaped booths! Countertop seating running almost the entire length of the restaurant. Our next stop was MoMA PS1, the Queens extension of MoMA, usually housing more contemporary collections and special exhibitions than their NYC counterparts. We love this museum. It’s housed in such a unique space – a former public school, which allows the visitor to duck into old classrooms and experience the art in an interactive way, as each exhibit gets its own, concentrated attention. We skipped it this time, but for a modern and quality food-centered take on the classic diner, definitely check out M. Wells Dinette located on the first floor of the museum. We started on the top floor at Wael Shawky’s Cabaret Crusades. I can’t begin to say how important this series of films is. Shawky has created a trilogy of films, each based on different episodes of the Crusades, told from the Arab perspective through puppetry. The photos below are from the display of glass marionettes he created for his most recent film, which we watched nearly in its entirety (almost 2 hours). These marionettes move, blink, and are mesmerizing to watch. The films are subtitled in English. For Shawky’s first movie, he was permitted to use historical Venetian wooden marionettes; in the second movie he made his own, out of wood. And for this final one, he made them out of Venetian glass. The art of puppetry and filmmaking drew us in: the story made us stay. This exhibit made me want to learn much more about the historical perspective portrayed, and its continuing resonance today. The exhibit is on until August 31, 2015 – I highly encourage fellow New Yorkers and people planning a trip here to go see it. We ended our day in Flushing Chinatown. Some call this “The Real” Chinatown, given the large population of actual Chinese immigrants here, as opposed to Manhattan’s Chinatown, which has dwindled as a residential pocket for Chinese families. Even though MoMA PS1 and Flushing are both in Queens, it took us an hour to travel between them, as subways are oriented toward Manhattan and not within boroughs. Most likely there are bus services that we could have traveled more directly between the two points; however it’s worthy to note the challenges that locals face when it comes to subway transportation accessibility. Our goal was to EAT (a recurring theme, you’ll see, on our trip). We walked around for a little while, splitting a juicy, hot curried lamb pocket, and pointing out different restaurants that looked interesting. I noticed Joe’s Shanghai, which I’ve been to in Manhattan’s Chinatown for soupy dumplings. In the end, though, I decided to give up the wandering, and look up the food courts. We chose the classic one, New World Mall Food Court. I don’t know what I was expecting. I haven’t been to the great street food vendor cultures of the world, like Singapore. When we walked in the mall, it looked un-extraordinary. But as we took the escalator downstairs, and walked around to get a sense of what was there, we were delighted. There are several vendors that make your food by hand to order, including dumplings, barbecued gizzards, and what I have pictured here: hand pulled noodles, which this master stretches after you order. I had a tough time getting any good photos because he works so quickly! He pulls out a lump of dough, then rolls it out by hand (truly by hand; no pin necessary for him). He then stretches the dough several times, creating more noodle strands with his fingers each time he stretches. Then he brings your order of noodles over to the cooks who put it in whatever dish you’ve ordered. You can get them fried, but we had them in their House Soup, which meant I didn’t have to choose between beef tendon, pork, squid, and whatever other delicious things were in there. We also got the mango green tea pictured, which was also made to order, and very refreshing. Many more food and travel adventures to come! Thanks for reading!